Centrica’s recent announcement on Rough storage capacity restrictions gave the NBP forward market a jolt. But it is SSE’s decision to reduce Hornsea withdrawal capacity that strikes at the UK gas market’s Achilles heel: a requirement for more deliverability as import dependency increases. It is almost a decade since a fire at Centrica’s Rough storage site sent shock waves through the UK gas market. Market infrastructure has evolved since the fire, with significant increases in gas import capacity reducing the UK’s dependence on Rough flexibility. But Centrica’s recent announcement of the temporary withdrawal of more than 25% of Rough capacity caused a notable market reaction. The Rough news was followed by an announcement by SSE that it would mothball 33% of withdrawal capacity at its Hornsea storage site. SSE, one of the largest investors in UK storage capacity over the last decade, cited ongoing weakness in UK storage market returns. SSE’s unwillingness to invest in maintaining Hornsea’s capacity illustrates the challenge the UK is facing in ensuring new fast cycle storage capacity is developed to shore up security of supply as import dependency increases. Centrica has announced it needs to reduce pressure at the Rough facility to 3000 psi for up to six months while it resolves a ‘well integrity issue’. The practical impact of this will be to restrict gas stored to between 29 and 32 TWh. This represents a ~25-30% reduction in capacity versus a maximum historical volume of 41 TWh in 2014. Centrica has stopped the sale of further capacity (SBUs) for the 2015/16 storage year to ensure it remains within this capacity constraint. This does not preclude Centrica from selling additional capacity into next winter if the issues are resolved within six months (e.g. in October). But the late sale of this capacity would restrict the length of the injection/withdrawal cycle. And there is also presumably a risk of capacity restrictions being extended beyond six months if the well issues are more serious than anticipated. SSE’s announcement on Hornsea impacts deliverability rather than space. Withdrawal capacity at the site will fall by 6 mcm/day. While this is relatively small in an overall market context, deliverability is the real constraint the UK gas market faces in winter periods. SSE’s decision is also an important signal as to the appetite for storage owners & developers to commit to further investment spend in an environment of weak market price signals (i.e. low seasonal price spreads and volatility). Rough is the UK’s slow giant. It makes up about 70% of total UK storage space, but given relatively slow cycling, only about 25% of the UK’s daily deliverability. So the 25-30% capacity reduction at Rough equates to a roughly 18-20% reduction in UK storage space. But importantly, the capacity restrictions at Rough will not impact deliverability (Rough SBU withdrawal rates are not dependent on inventory levels). The impact of the Rough restrictions can be visualised in Chart 1 which summarises UK storage capacity. The vertical axis shows deliverability across all of the UK’s operational storage sites. 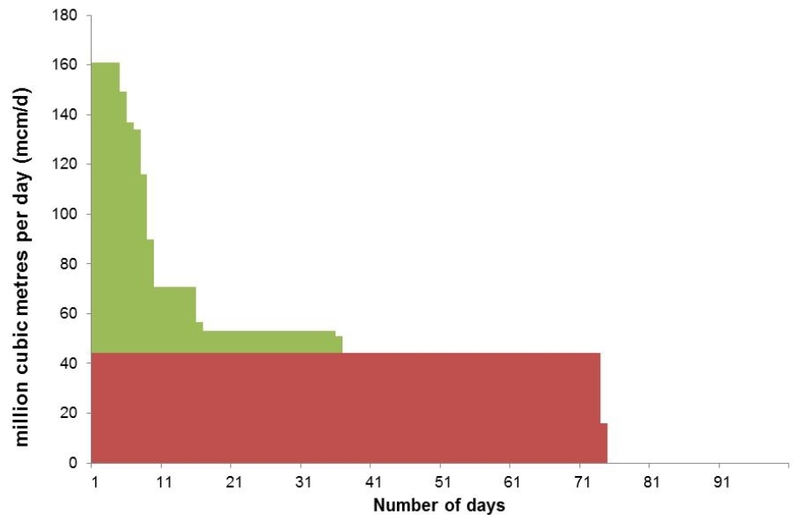 The horizontal access shows how many days that deliverability can be maintained assuming maximum withdrawal. The capacity restrictions on Rough, to the extent they reduce gas stored for next winter, will proportionately reduce the length of the brown area at the bottom of the chart. In principle this acts to support seasonal price spreads at NBP. But in practice the impact is likely to be relatively subdued given the UK’s access to ample seasonal flexibility on the Continent. That said, the UK gas market would be more exposed to a prolonged cold spell next winter. Rough deliverability, the height of the brown area in the chart, will not be impacted. Storage deliverability is an important factor that acts to dampen prompt NBP price volatility. So the volatility impact of the reduction in Rough pressure is likely to be negligible. The impact of SSE’s Hornsea announcement on the other hand is all about deliverability. The 6 mcm/day reduction of deliverability at Hornsea means a 4% reduction in UK storage deliverability. This is relatively small in an overall market context, but not trivial. For example it is equivalent to about one third of the deliverability from SSE’s latest fast cycle storage facility development at Aldbrough. As UK import dependency increases, the primary concern from a security of supply perspective is storage deliverability. This plays an important bridging role over the two to three week period that it can take for the LNG import supply chain to respond to a major infrastructure outage or prolonged cold spell. The Rough and Hornsea issues are likely to have a relatively small impact on UK seasonal price spreads and prompt volatility. The potential for a pronounced pickup in the seasonal flow of LNG imports, for example, is a much higher impact factor currently looming on the horizon. But Centrica and SSE’s recent announcements do highlight that the UK is more sensitive to interruptions in storage asset operation and investment than its Continental neighbours. The Rough and Hornsea assets are the oldest in the UK fleet. The current issues at each highlight a broader problem facing owners of older facilities in the UK and across the continent. It is not a straightforward decision to commit to spend significant maintenance / renewal capex to extend the lives of older facilities in an environment of low volatility and spreads. This unwillingness to invest in existing facilities may ultimately contribute to the market price signal recovery required to support investment in new storage infrastructure.